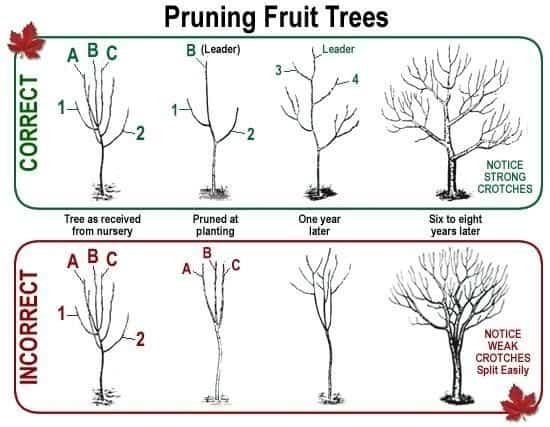 Pruning should be started when a tree is young to improve tree structure for the rest of it’s life, but can be done on a tree of any age if you are determined. This will ensure that it will grow into a tree which is easy to pick from for years to come, improves fruit quality, resists disease, and will not break under its load when bearing heavily. Pruning is best done in late winter if you are growing apples or pears and during the summer for peaches, apricots and cherries. More on why later. If you’ve never done it before, pruning fruit trees can be intimidating since it requires making some bold cuts. However, it’s such an important part of growing fruit that it is definitely worth learning a few basic techniques. Pruning a tree is actually fairly easy to do and does not take much time. Even newbies like us should be able to prune a young tree in less than 5 minutes once they get the hang of it. Pears and apples are known as pome fruit. Cherries, apricots, and peaches are known as stone fruit. They are pruned differently and at different times, and you must know the difference in how to do this before you start. It is easier than I thought it would be, but a bit of time is needed to learn. Here are a few videos to start you out. This one is on a young peach tree. Peach and cherry trees should be pruned in the summer to prevent introducing disease into the cuts. Here is an excellent video on pruning a young apple tree with information that is better to hear and see (if you are a visual learner as I am) than to read. You want an ‘open center’ (the vase shape) for good sunlight penetration and air circulation. You want to encourage the outward growth of future limbs. See graphic below for right and wrong ways to make cuts. Don’t prune cherry trees until after they bear in the summer. You want somewhat of an ‘open center’ for good sunlight penetration and air circulation. Again, you want strong branches which come out of the trunk at 45 degrees. Greater or lesser angle makes for a poor weight-bearing branch later in the life of the tree. You want to encourage outward growth of future limbs. Where you cut determines which way the new branch will head. This is called a heading cut. This image below is for a heading cut. The notches mentioned in the image above refers to the degree of angle. of branches to the trunk of the tree. When we were selectively ‘trimming back’ our little orchard (only 9 trees at this point), we soon understood the real reason we prune. It is to encourage correct growth and a excellent outcome. As we worked, our minds were making all kinds of associations to the pruning God does in our lives. It makes so much sense when YOU are THE PRUNER (aka the vine-dresser, the husbandman, the gardener)! Every cut has a desired future goal. One of the reasons I am so sad that our culture is moving more and more away from an sustainable and simpler lifestyle is because we are losing our understanding of these foundational principles in life! How wonderful to teach these concepts to our children and their children as we teach and work side by side in the orchard/garden. Purposeful teaching, especially when we can do some hands-on is necessary for leaving a rich biblical legacy for our families. This has helped me with the knowledge I need to get started. I appreciate everything you have shared about pruning. The place we have lived the last 2 years has a BUNCH of fruit trees. After irrigating them and my dad discovering they were planted too deep we have gotten a lot of tasty fruit from them. Though our Anna Apple tree gave us an apple and a half last year (worm got part of one). Hoping for a few more this year, but its looking pretty feeble, maybe a little pruning will help! Oh, I hope you can rescue some of them!! Let me know how they do 🙂 I missed out pruning last year and we will have to be patient, but I think we will have a great crop!! Blessings to you, dear friend! So excited about this year. I pruned my satsuma trees just a little this year. I was very nervous! There are tons of flowering buds on it, I hope we get a better crop than last year. My apple trees are still so young. Any thoughts on when to start pruning them (age wise). I now have to wait till next year because the pruning season is pretty much over. Kristie, I’m no expert, but have read that it is wise to prune them as early as the first year to begin forming their future shape, but also if it is too late, you should wait until next year for that reason 🙂 I will be looking up a satsuma tree…never have seen one 🙂 Save me a bite, will you ?? Thank you for your thoughts. I wonder if it’s too late to do an espalier? 😀 Crazy dreams. Satsumas are related to the orange. They are largely seedless and very delicious! 😀 When we moved in there were two fully mature trees in our yard. I love to make satsuma-lemon marmalade with them every year! (I need the lemons because the satsumas do not have much pectin in them). That is very cool 🙂 As for the espalier, I think it has to be done over a period of years and the pruning started young. My Dad was from Holland, and he had espalier’d pear trees on the side of his home. We’ve had the pears 🙂 here’s the link to a post I did on his old homestead: https://deeprootsathome.com/?p=10820. Thanks, Kristie! Susan, I wish you well with those big old apples. I hope they will bear again for you! Thank you for your kind words! The apples we have a re spray-free for disease (no blight), but not for pests. Here is a link: http://www.millernurseries.com/cart.php?m=product_detail&p=282 We’ve purchased from Miller for years and have been satisfied. they also have short (dwarf) peach trees 🙂 I hope that answers your question. If not, I’ll give it another try 🙂 Blessings! Oh, dear. Another thing I forgot to add to my to do list. You reminded me. Thank you… I think. Last year in heavily pregnant desperation, I ordered about 15 fruit, nut and berry (apple, plum, cherry, hazelnut, honeyberries, blueberries etc) and because I was unable to do any physical labor without serious health consequences, they were hastily planted in our unprepped, hard, crusty post-construction soil. During the summer, they grew… but I’ve yet to see if they survived our mild winter (we have another month of snow on the ground). Temperatures are warming now, so I guess I should get out there and prune them. Hopefully there’s survivors. This was a good post, and very timely for me. Oh, I cannot wait to plant fruit trees. They will be one of my very first purchases once we move into our own home… and I’m sure I’ll be referring back here for help on pruning them. It seems to scary to cut away so much of the branches, but what a beautiful example of what Christ does with us! You know, Anna, I feel all trembly when we lop off so much of the growth on these trees, but it is amazing…all that ENERGY is used to put on new productive growth!! It has helped me understand more of how our Heavenly Father trains us!! Yes!